Enjoying the view down the valley or dreaming of that 2 in 1 Pie ® at the Weighbridge Inn? Unbelievably it's over three months since our last update - think that's a (bad) record breaker! 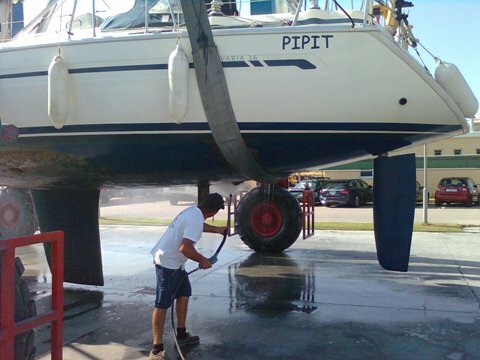 We have been busy, continuing to thoroughly enjoy life in the Cotswolds, spending a month back aboard Pipit in the Ionian (including a week's annual maintenance work) and - one of us turned forty-ten! Earlier in the year while many were complaining about the lack of a 'proper' summer in the UK, we were revelling in the more moderate temperatures; walking, pottering in the garden and having several barbecues, even eating al fresco on numerous occasions! 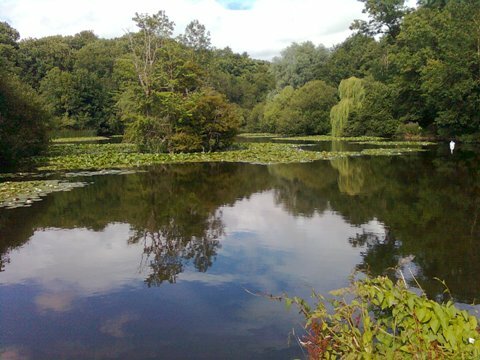 Cherington Lake - a beautiful stop on one of our local walks. 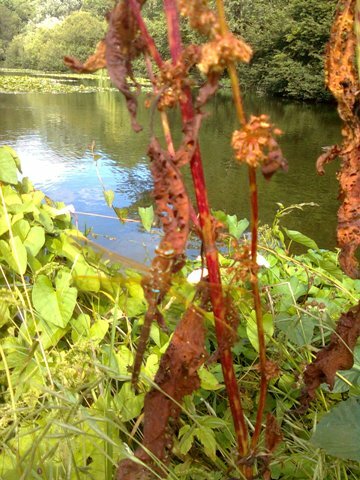 Can you spot the brown hawker dragonfly? 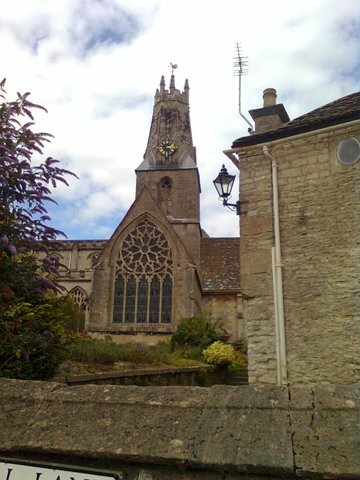 We had a day out one weekend in June and drove (an Italian car on a Roman road - the Fosse Way) to Moreton-in-Marsh where we had a stroll around this pretty Cotswold village followed by a tasty lunch at the Greek Deli in the Cotswolds. We also purchased a few Greek goodies to take home. In July we visited Gatcombe Park (Princess Anne's estate) for the Festival of British Eventing, meeting up with friends of Andy's, sipping Pimm's in the summer sunshine, walking part of the course and getting a great view of a good section of the course including the water jumps. We were very intrigued hearing an announcement for the next event in the main arena - 'Pony Sky Diving' - wow, really?! That's going to be something - how big do the parachutes have to be? Hope they don't get too frightened on the way down though, could be very messy... Ah, what Andy originally heard as 'Pony Sky Diving' was actually 'Pony Scurry Driving' - I blame the Pimm's... That, along with the Shetland Pony Grand National, the young riders of which are certainly future eventing competitors, were hotly contested and great entertainment. A lovely day out and just a short stroll from our cottage, reminding us how very lucky we are. August was a bit cooler and wetter, the only real down side of which for us was that our crop of tomatoes didn't ripen and our chilli plants, whilst very healthy, never got that last blast of summer heat to turn their crop red, or in the case of one variety, orange. The Scotch Bonnets produced flowers but these never became devilishly hot chillies. 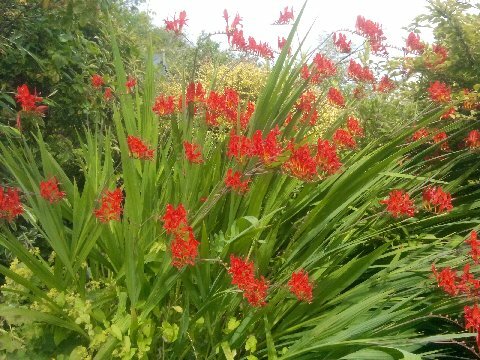 We'll have to plant a bit earlier next year and hope for some late warmth or transfer them into the conservatory. 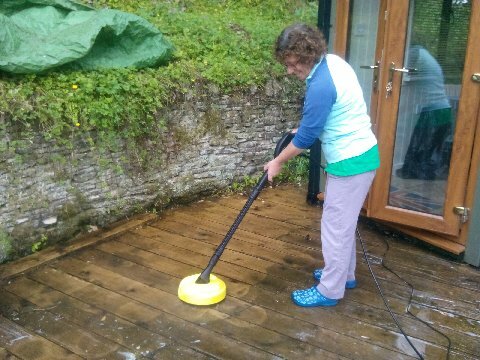 Great scrubber, works really well - and a Karcher accessory... Spot the 'before and after' sections. Summer colour in the garden. The slightly cooler weather of August allowed us to enjoy a very local walk, stopping at the Weighbridge Inn and sampling one of their famous 2 in 1 Pies ®. Yes, so good it's a registered trademark! A real treat - absolutely delicious and very highly recommended. 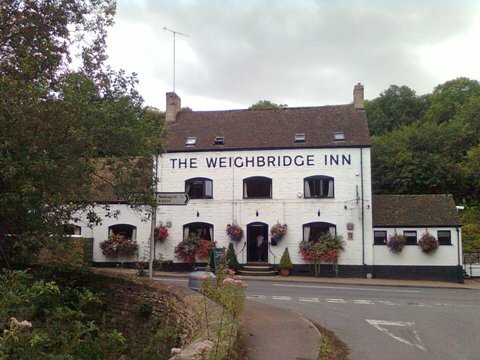 The Weighbridge Inn - home of the famous 2 in 1 Pie ®. 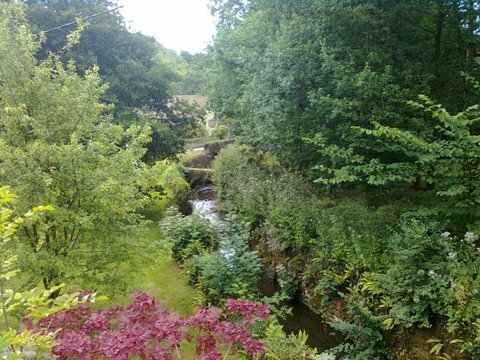 One of the many streams running through the Stroud valleys. In past centuries, the streams in the region powered 150 (mainly wool) mills. Minchinhampton Church - the spire was truncated in the early 18th century as it was in danger of collapsing due to the supporting arches not being strong enough. The big event of August was Andy's birthday - forty-ten! We celebrated with a few close friends over pizza at our perfect local, the Queen Matilda. Delicious stone baked pizzas (in fact the best we've had since Sicily) and our favourite Sicilian wine and great conversation made for a thoroughly enjoyable evening. So good in fact, that we repeated the celebration a few nights later. We won't mention that the second celebration was actually because someone got the date wrong and missed the first party. Perhaps that's what happens when you are even older than forty-ten... Anyway, apart from being spoilt with two birthday celebrations, I gave Andy two special gifts; wine-making equipment including the kit for hedgerow wine, and a bottle of the Cotswolds Distillery's first ever single malt whisky - it won't be ready until October 2017, but should be worth the wait. Before then we can, however, visit Andy's whisky one day and have a tour of the distillery - should be another top Cotswold day out! 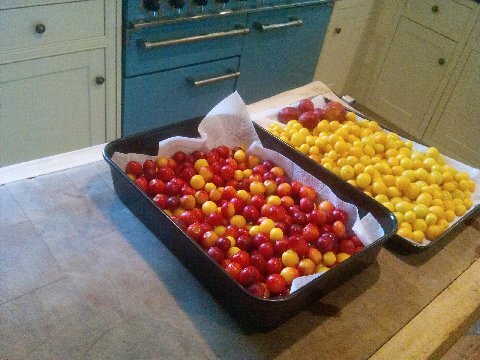 Of course with the hedgerow wine kit waiting for its first trial, we had some ideal pickings in the form of Mirabelle plums along the path of another of our local walks. As we were due to fly out to the Ionian a few days later, we washed, stoned and froze these little gems ready for making our first batch of 'free' wine. 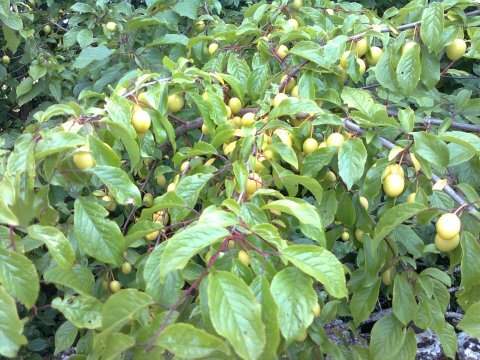 Mirabelle plums - can't tell you the secret harvest location obviously - need to protect our crop for next year. Ready for stoning and freezing. 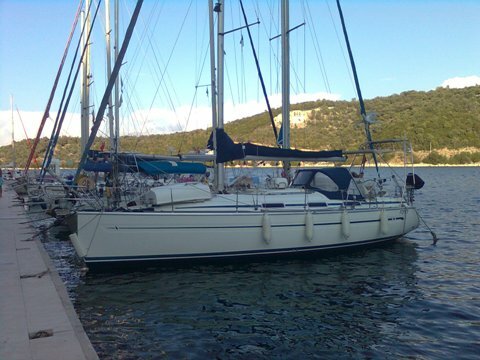 So early September saw us back in the Ionian to spend a month aboard Pipit. Typically, the evening before we left, the weather in the UK was glorious with ample sunshine and warmth forecast for the following week. And the forecast for our arrival in Greece? Two days of thunderstorms of course, with the usual heavy rain and strong winds. Rather than hope we'd get from the airport to Nidri in time for the 1400 ferry to Meganisi with the prospect of then getting us and our bags aboard Pipit via a RIB (we had purposely left Pipit a long way off the quay so a passerelle would be no use) in the middle of a thunderstorm, we opted to spend two nights in Nidri and head to Meganisi when the weather would be better and the marina less crowded. The weather was actually not quite as bad as forecast, but we were glad we'd stayed in Nidri as we had one of those bizarre chance encounters that make you realise what a small world it can be sometimes. Strolling along the seafront in search of a pre-dinner Mythos, we heard someone call out Andy's name. What a surprise for him to spot Steve & Fre, the couple from whom he bought his last house in Chipping Sodbury - 20 years ago! A few Mythos's later we arranged to meet the following night and subsequently had a great evening with lots of laughs and not a little catching up. As forecast the weather improved, and we arrived in Vathy to find Pipit in good order and just as we left her. We spent two days in Vathy enjoying catching up with friends and visiting our favourite tavernas. 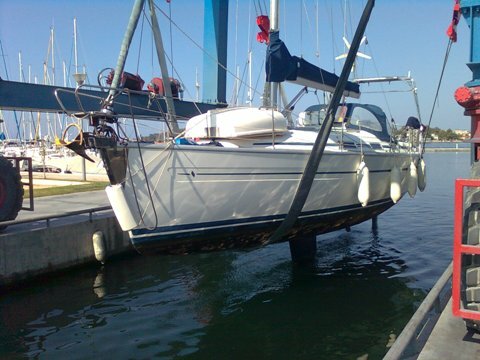 We then spent two lovely and relaxing days at anchor en route to Preveza where we were to lift Pipit out for a week at Cleopatra Marina. Andy even had time to do some afternoon reading in the cockpit when the wind direction was such that the sprayhood shaded us perfectly from the sun - ideal. Despite knowing we'd have a week of hard work in temperatures of up to 32°C, we were both looking forward to doing the annual 'out of the water' maintenance on Pipit. 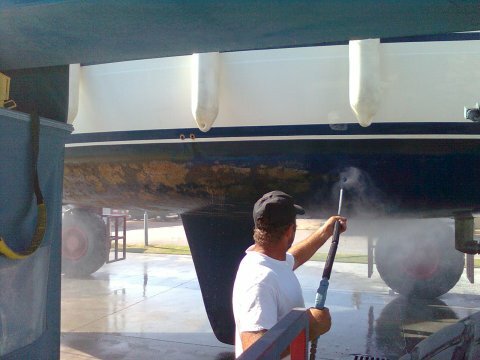 Polishing, antifouling, changing anodes and a few other small tasks feel less onerous with the knowledge that at the end of each day, we can head back to one of Cleopatra's air-conditioned rooms and eat out each evening at the on-site taverna. 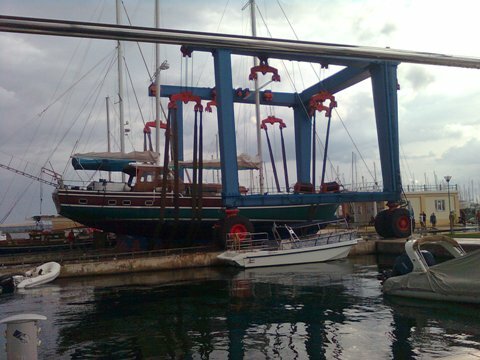 We are always a little nervous to see her hoisted out of the water, transferred to a trailer and positioned in a cradle in the boatyard. 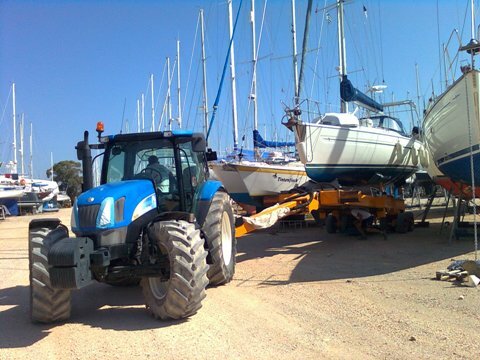 We know how skilled the hoist and other yard staff are, so we shouldn't really worry, but dry land is just not a boat's natural environment. We take virtually the same photos every year, so skip past if you've seen it all before... Mostly, it's for our own record of how much fouling is/was on the hull each year and, of course, Andy can't resist photos of the yard's machinery! 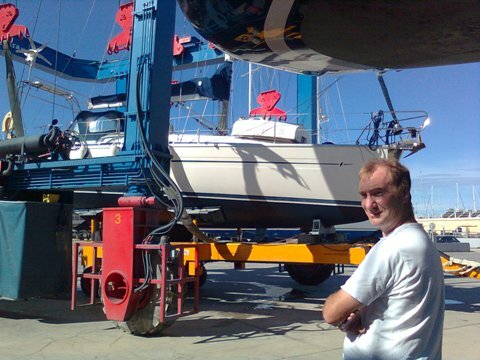 We were placed much closer to other yachts than we have been in the past but, although we had to be careful when moving the platform we used when polishing the topsides, this was a benefit as they provided shade through most of the day. Close to our neighbour astern too, but it wasn't actually quite as close as it appears in this photo. 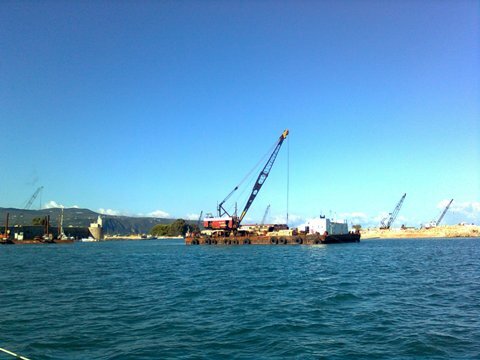 As if we needed it, we witnessed evidence of the yard staff's skill when they lifted the following two giants out with the 300 ton hoist (the largest travel lift in the Ionian and in Western Greece) - they took great care in ensuring the strops were correctly positioned, even having a diver in the water to check before they lifted them. We spent 6-7 hours each day working and had only one day lost due to rain. 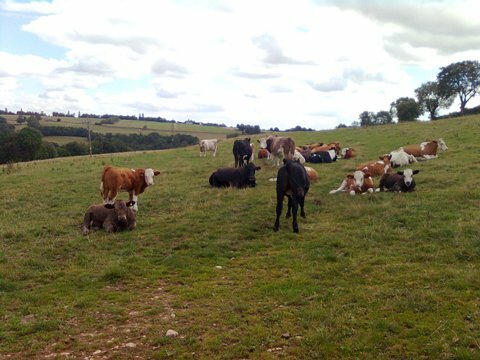 We could shorten the time we're 'on the hard' down from a week to perhaps four days if we worked for 10 hours a day, but we prefer to do the maintenance at a less stressful pace - working short days in up to 30°C, stopping only briefly for water and a very quick bite to eat, literally 'on the hoof', is tiring enough! 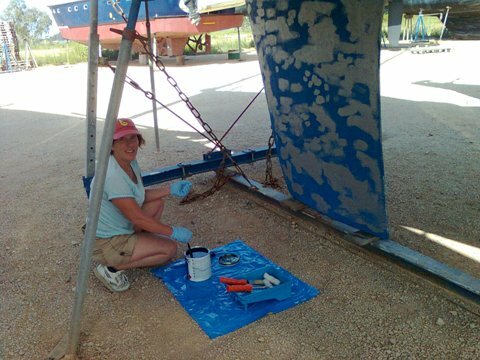 Topsides polished, hull sanded and primed - hurrah for Primocon! 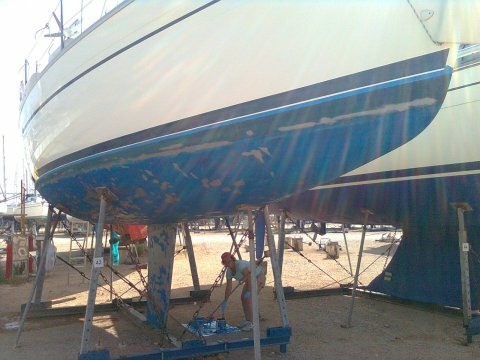 Stirring the antifouling ready to put on the first coat - the most satisfying of the jobs as you see instant results. 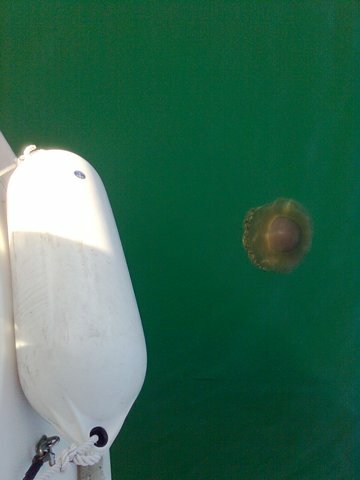 Saildrive with new anode (still following Tim's top tip of putting a little Sikaflex on the prop cone allen bolt!) 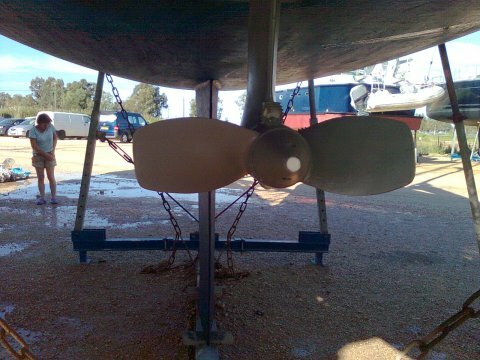 and antifouled with Mille Drive. Finishing work each day, we returned to the haven of our air-conditioned room, showered and just relaxed in the cool for a while before heading to the on-site taverna for a meal. This year, we were very lucky to enjoy several evenings in the company of Alan & Jane from Peregrine 8, who are also regular visitors to Vathy, including quite a memorable meal one night over in Preveza during which time we had to scurry inside when a spectacular thunderstorm came through. Just after we re-launched, we were also very happy to be able to meet up with Tony & Alison from Reveller who were fellow Lagos over-winterers back in 2011-12 and whom we last saw in Ceuta (the Spanish enclave in Morocco). Some very late but great nights with both couples, chatting and laughing over dinner and a jug or three of wine! Heading back where she belongs. Antifouling the patches from the cradle and trying not to slip over - those 'Croc-a-like' shoes are now 'racing slicks' held together with cable ties and have definitely seen better days! 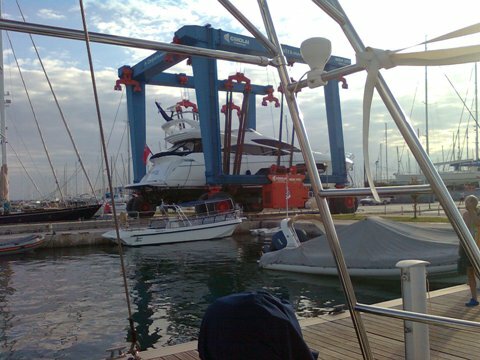 Once back in the water, we spent more days than planned at Cleopatra Marina due to a change in the weather. It also afforded us more time to enjoy very amiable evenings with Alan & Jane and Tony & Alison. Thank you for the very enjoyable company - we hope you have a good winter and look forward to seeing you next season! Heading back south again, we arrived a little early for the hourly opening of the floating bridge in the Lefkas Canal, but this gave us the opportunity to take some photos of what seems to be an on-going project at the northern end. This end of the canal was previously quite narrow with a sandbank one side and lumps of concrete & rocks on the other. The buoys marking the lumps of concrete & rocks were on long lines so that in strong northerly winds, the buoys drifted some distance south of the obstructions, making navigation more than a little nail-biting. 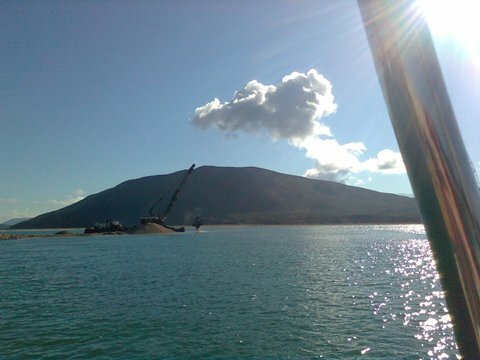 Last year this section was dredged and widened making navigation much safer and easier. 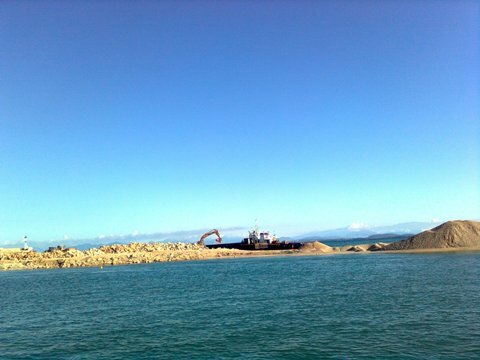 There is now much more dredging being done and stone being laid, we assume, to reinforce the northern sandbank to prevent or curtail future silting. 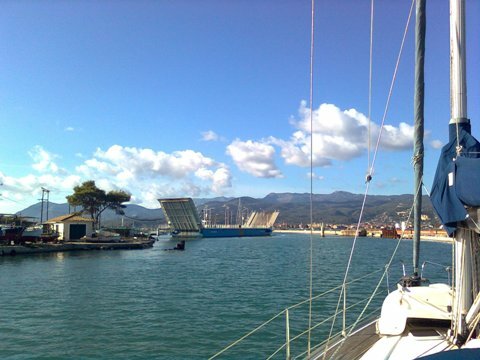 We did hear one rumour that the widening was also to allow superyachts to navigate the canal and another rumour that a new marina is being built there. The floating bridge opening to let us through to 'home' waters. First stop back was our favourite anchorage, where we dropped the hook in 'our' spot. A few boats anchored nearby through the day but by late afternoon or early evening it was just us, the kingfishers and, early the next morning, a lone fisherman. 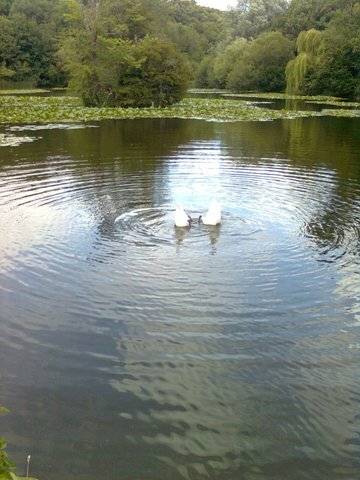 Idyllic! 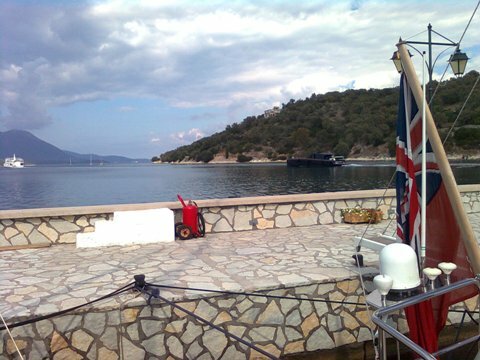 All by ourselves - the (unoccupied) boat on the pontoon on the right belongs to the villa above it. 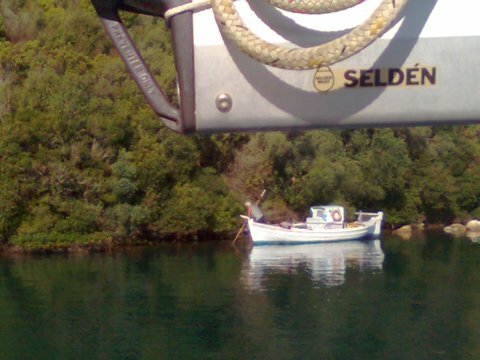 A poor photo due to it having been taken with the phone and the focus being on the boom, not the fisherman, but we included it here as we were very intrigued about what he was fishing for. He was propelling himself along the very edge of the water with a long pole, sometimes even pulling himself along under the overhanging trees, then using another spiked pole to gather some sort of shellfish from the rocks. Anyone who knows what he was gathering - we'd be very curious to know! Next stop was Spilia, to the quay adjacent to Babis and Panos's taverna. A sentimental favourite with us as it was always the first night's stop when we chartered here. 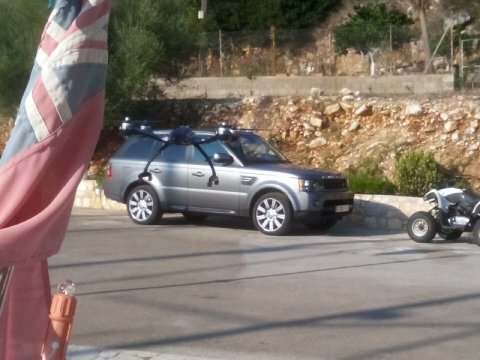 We also spotted a kingfisher whilst having a cooling afternoon beer at the taverna. It was very small (the kingfisher, not the beer) so perhaps a young bird. We watched him or her perching on the line securing the pontoon to the beach, staring intently at the water and periodically diving in (only a few inches deep) for a fish. Prior to each dive, it sort of hovered over the water a bit like a hummingbird - fascinating and behaviour we've not been lucky or near enough to observe before. No photos unfortunately, as we haven't a good enough camera, but if you want to see some stunning kingfisher photographs, the work of wildlife photographer & journalist Charlie Hamilton James is pretty hard to beat! 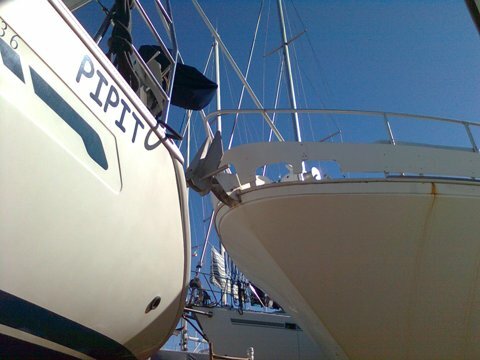 Pipit on the quay at Porto Spilia. 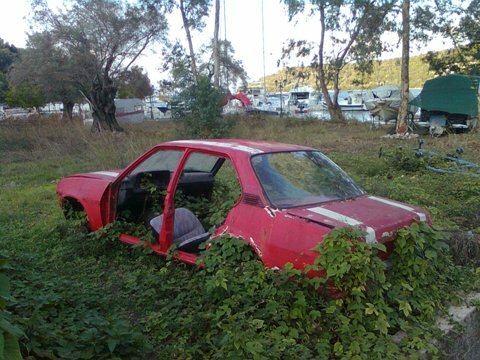 The resident Opel Ascona now has its own garden - see it in its former 'glory' here. We can see our boat from here! 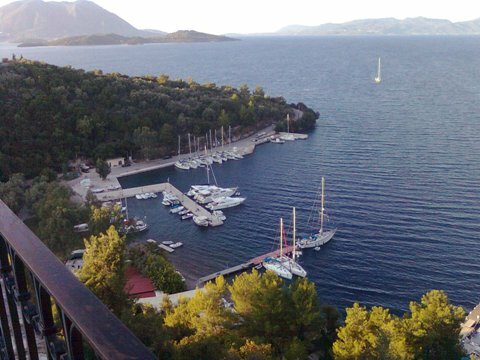 That stunning view again, worth the climb up to Spartochori for that alone, but the coldest Mythos on the island served at Summer Sun Bar is a definite bonus! We returned to Vathy for the unavoidable washing, shopping and filling with water. We did some more relaxing as well as planning the jobs we needed to do to put Pipit 'to bed' for the winter. It was still quite hot during the day, and many jobs needed to be done closer to our departure, so relaxing was the main item on the agenda. It was lovely also to see other Odyseas regulars, Donal & Anne from Humdinger II who were also preparing their boat for the winter in Vathy and Trevor & Sally from Dreamcatcher. Despite the chances of thundery weather in late September and early October, it really is a great time to be in the Ionian. With fewer boats and visitors, you can see the owners and staff at the tavernas, shops, businesses and the marina beginning to wind down from the frantic rushing they do during the height of the season - there was a kind of 'end of term' atmosphere about the place. There were only a couple of superyachts of the motor variety, but this sleek stealth-like one was striking. 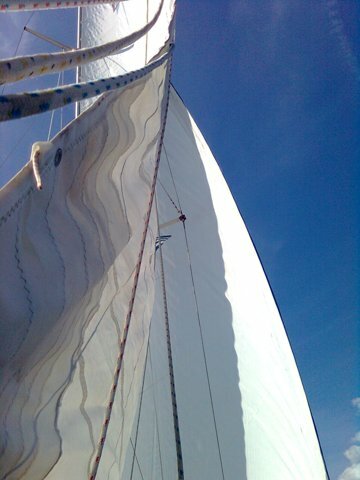 With our month seemingly rapidly coming to an end, we left Vathy for a few days at anchor and had two lovely sails - mostly very slow drifting at 3 or 4 knots, but when the afternoon breeze picked up to 8 or 9 knots, we were quite happy to be silently gliding along at 5 - 6 knots. 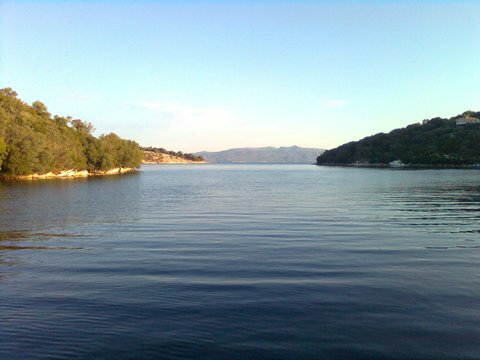 We spent a couple of nights anchored in Vliho Bay, again idyllic with no afternoon katabatic winds, moonlit night skies filled with stars and pleasantly cool overnight temperatures. Back in Vathy for our last few days we tried to get the essential washing done (things that we were leaving aboard - this time we could take home whatever was left and do it at our convenience like normal people, not have to queue for the marina washing machine which was busy enough before it broke down twice!). During the days we prepared Pipit for her winter in Vathy, although we tried to work mainly mornings and late afternoons as the midday heat was still quite intense, and ate out at our favourite tavernas in the evenings. The day before we were due to fly home, we said goodbye to Pipit, Vathy and everyone at Odyseas Marina and boarded the afternoon ferry, not without a few tears I have to say. We were sad to leave, but at the same time, also genuinely looking forward to returning to our home in the Cotswolds. From one of our favourite places to another - how lucky are we? As our inbound flight was leaving Preveza at lunchtime, leaving Vathy the same day would have meant catching the 0730 ferry and, although we could have 'killed time' in Nidri before going to the airport, the idea of doing all the final 'have we done this and that' checks first thing in the morning and rushing off worrying if we had done them all was potentially too stressful, so we opted to spend our last night in Nidri, again at the very pleasant Athos Hotel. This gave us the chance for a last meal of the season at the wonderful Restaurant Roots - a taverna that serves Greek food, as virtually all the waterfront tavernas in Nidri do, but with that little something special. The food at Roots is very obviously not massed produced with not only the more traditional dishes but many with a modern twist - we really loved the 'Roots Salad' of green salad leaves, orange, blue cheese and almonds with a balsamic dressing, and the fried calamari was tender and succulent and had the crispiest and tastiest batter we've ever had. Somehow, despite leaving many of our summer clothes aboard Pipit, our bags were as full and heavy as they had been on the outbound journey. Well, we did bring home our sailing coats (haven't needed them in the Ionian, but they might come in handy here!) plus a couple of bottles of Tentura (a Greek cinnamon, nutmeg & clove liqueur), plus some Greek honey and homemade grape spoon sweet we were given as gifts. The queues at the airport were expectedly tedious and it was much busier than we anticipated. A year ago when we took Andy's mother back to the airport after her week's visit with us, we thought there was something wrong when we arrived as there were just a handful of people there! I guess more people have been lingering into October this year. Our journey home was all on schedule and the trip from the airport to the cottage was made hassle-free again courtesy of Cotswold & Stroud Airport Taxis. The colours of the trees along our route home reminded us how much we were looking forward to enjoying the autumn here in the Cotswolds. We had some more chores to do over our first weekend home, but made time to relax in front of the fire over a glass or two of wine before dinner. There are ample central heating radiators in our cottage, but the log burner, in which we've been burning kiln dried logs, is just fantastic and it's hard to resist the warm glow of a real fire. 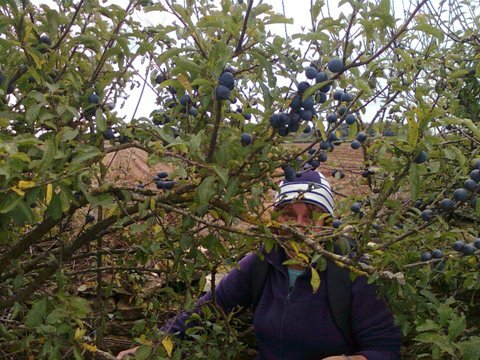 We also donned our walking boots over the weekend and harvested a good crop of sloes along one of the paths not far away. In the garden, our chillies and tomatoes, nearly all of which were green instead of the red they should have been, have been picked, the chillies frozen and the tomatoes are waiting to be made into green tomato chutney. Sunday's lunch was much later than planned but cooking it together reminded us again how much we love it here. What better way to celebrate our return from the beautiful Ionian to the lovely Cotswolds than roast pork with perfect crackling accompanied by roast potatoes, parsnips and fennel, butter steamed carrots with caraway and followed by frozen yogurt topped with luscious Greek sour cherry spoon sweet. The sloes were washed and frozen (this ruptures the fruit allowing the flavour to leak out into the gin). Now thawed, they've been divided into three batches in Kilner jars and mixed with gin and sugar. One has been left plain, one has had a couple of drops of almond essence added and the third has been flavoured with a strip of orange zest, a stick of cinnamon and a couple of cloves. We've done the almond essence flavoured sloe gin before, which was delicious, but the orange and spice one is new to us. We'll report back at Christmas on its success! I guess that's about all our news for now. 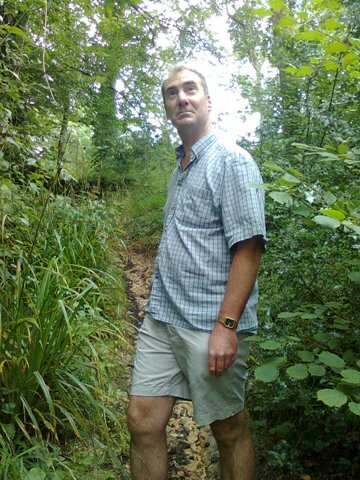 There will be more news of two new websites we're developing and some interesting volunteer work I will be undertaking. All will be revealed soon!